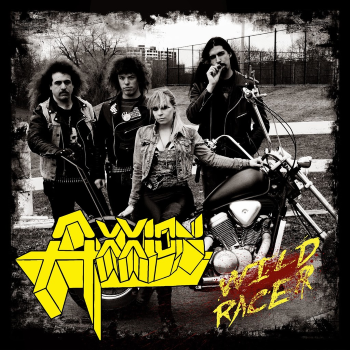 Axxion (pronounced “action”) are at it again with their long-awaited debut LP entitled “Wild Racer”! Well, what else can I say about this extravagantly talented band? 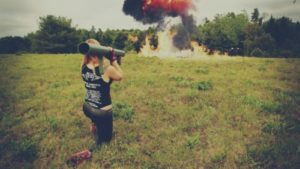 From their very first released song to now, these dudes (and dudette, of course) have definitely proved themselves throughout the process, and with the creation of new material, a music video and a dedicated following, the wild racer that is Axxion has never shown signs of slowing down. The dedication to preserve the 80s sound within the recent heavy metal scene is very much astounding, whereby bands just like Axxion should be easily recognized for influencing a new generation of young and wild metalheads. With that being said, the brand new LP is nothing short of pure traditional heavy metal. 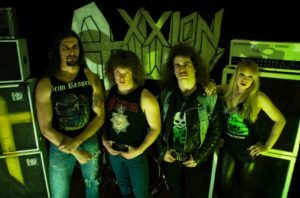 Now, I’m usually the type of person to enjoy traditional metal less than my personal favorites such as speed metal, NWOBHM and even USPM, but Axxion seem to find a way to incorporate some of those elements into their repertoire. Sure, the same riff structure can get a little bit mundane at times but these guys sure as hell know how to make up for it with the inclusion of Shred’s intricate solo work and Devon Kerr’s downright energetic vocals that perfectly overlap the fist-pounding drums and basslines. I would also definitely like to see the band introduce more progressive and USPM-like elements into their sound, rather than constantly writing traditional metal material. I think a good example of a band that upholds this notion is Canadian legends Black Knight, but hey that’s just my opinion entirely.